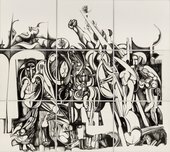 This conference will bring together scholars, writers, curators, researchers, and artists to reflect on the international solidarity movements that emerged in the second half of the twentieth century during processes of decolonisation in Africa, Asia and Latin America. These transnational solidarities expressed themselves in landmark events, historic conferences and festivals; in the formation of associations, magazines, and journals; and significantly, in the explosion of new creative manifestations in literary and visual artistic arenas, such as novels, poetry, theatre, film and visual arts, and in the rise of postcolonial studies and critical theory. The conference programme will be organised into three areas – historic landmarks, political and cultural platforms, and emancipatory futures. Landmarks will include the Cuban Revolution, the Algerian War for Independence, as well as liberation movements in Vietnam, South Africa, and Palestine, among others. Platforms will include the Pan-African gatherings, the Bandung and Tricontinental Conferences, and publications such as Lotus, Souffles, and Black Phoenix. Emancipatory futures will be explored in the conference’s two keynotes, panel presentations, and a closing panel on the future of solidarity scholarship. This conference is driven by the need to critically engage histories of solidarity and reflect on their implications for our time. While the first wave of decolonisation inspired by the spirit of Bandung has subsided, the effects of Cold War geopolitics persist. The prevalence of neo-liberal globalisation compels a new politics of solidarity to confront ever-increasing imbalances of power. These crises have resulted in the rise of new resistance movements such as Black Lives Matter in the USA and anti-globalisation, anti-racist and environmental platforms worldwide. Dedicated to the liberatory strategies of the past and the challenges of the future, this conference will be comprised of panels that deepen our understanding of global solidarity movements, particularly those originating in the Global South. The conference will consist of nine panels arranged across two and a half days, plus keynote and artist presentations. Tariq Ali and Russell Rickford will deliver the conference’s two keynote addresses. Other speakers include, subject to change; Omar Barghouti, Eva Bentcheva, Anna Bernard, Kassahun Checole, Manthia Diawara, Kay Dickinson, Jihan El-Tahri, Zeyad El Nabolsy, Rafael Enriquez Vega, Isabel García Pérez de Arce, Anthony Gardner, Elizabeth Harney, Brigitta Isabella, Gavin Jantjes, Kristine Khouri, Louis Klee, Christopher J. Lee, Anneka Lenssen, Đỗ Tường Linh, Lydia H. Liu, Anne Garland Mahler, Doreen Mende, Naeem Mohaiemen, Elaine Mokhtefi, Morad Montazami, Nakajima Izumi​, Holiday Powers, Dina A. Ramadan, Yasmina Reggad, Nada Shabout, Sanjukta Sunderason, Alexia Tala, Greg Thomas, Ming Tiampo, Cecilia Vicuña and Ala Younis. This conference is co-organised by Hyundai Tate Research Centre: Transnational, the Institute for Comparative Modernities at Cornell University and the Africa Institute, Sharjah.